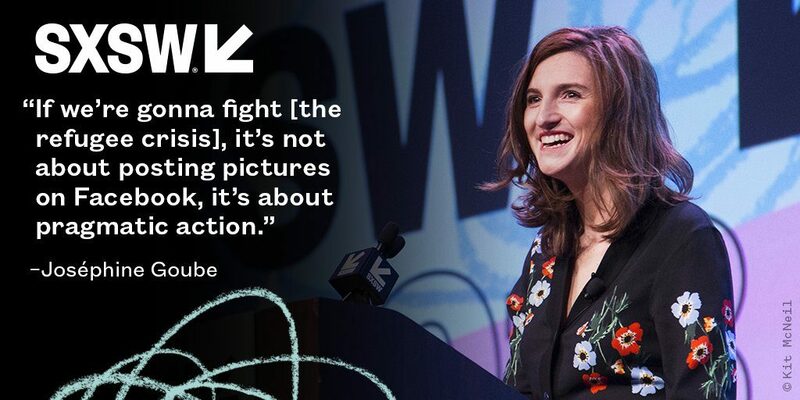 Over the past fortnight, our CEO, Joséphine, has been spotlighting our work via the grand stage of the South by Southwest (SXSW) media festival. If you couldn’t make it, don’t worry. We caught up with her to recap her keynote speech and the conversation that followed, in her own words. Opening SXSW was a thrilling experience, and also one that filled me with enormous optimism. In a country living in the shadow of travel bans and closed borders, opening the festival on a political note in support of refugees is something I was hugely excited about! I started my contribution with the story which brought me this far. I’m from a small town close to Calais, so I know first-hand that there have always been migrants and refugees, that hasn’t changed. What has changed are the nationalities involved and, more worryingly, the treatment they receive. Growing up, I couldn’t understand how advances in technology could be making my life better and better as the years went on, but those benefits just weren’t extending to those who so desperately needed a voice. In fact, the refugee situation has been worsening, in direct proportion to the political rhetoric surrounding their plight. Those with the most power have been doing the least to avoid painting these people as animals. The powerful symbolism behind living in a ‘jungle,’ and migrating in ‘swarms’ has been shamefully abused. So that’s where Techfugees came in. A huge part of what we do lies in reframing the narrative, showing these people as tech-savvy and innovative. Not victims, nor heroes, just the useful members of society they truly are, and human after all. Because this is not a refugee crisis. This is a crisis of hospitality. A crisis of international duty. Welcoming refugees used to be an honor for the free world, with open arms we sheltered them from communism. What has changed? Who now has us squabbling over resources which, in truth, have never been more abundant? All the media spin in the world can’t change the facts. War might be good for the headlines, but it’s climate change we need to worry about. According to the World Bank, 143 million people could find themselves displaced by 2050. You can build all the walls you want, it won’t stop them from being washed away. I invited the audience to remember the Texas Dust Bowl of the 1930s. 3.5 million people, perhaps the grandparents of some of those gathered in that room, forced to flee to the western US, most to California, leaving their land and houses. It was the largest internal migration in US history, and with climate refugees only set to increase in number it’s easy to superimpose their faces onto those fleeing Syria today. We're live with Josephine Goube, the CEO of Techfugees, to learn how migration drives innovation and how a simple Facebook post became a global movement. This is something we need to build into our democracy now. Otherwise, those who currently bury their heads in the sand over problems which don’t directly affect them might find themselves begging in vain for the super-rich to let them into their flood-proof castles. The response to my speech was incredible, social media went crazy. 80 people immediately asked to join the Techfugees group and enormous goodwill flooded in from Twitter. It was heartening to see people not just regurgitating what I’d said, but rewording the sentiment and echoing with their own voices. They understood, and it felt like something they were a part of themselves. The rest of the festival was dominated by the news cycle, particularly Facebook’s abuse of user data through Facebook apps. This was interesting to hear, as such misuse could seriously harm refugees on their journey. Such a focus on data ethics was great to see. 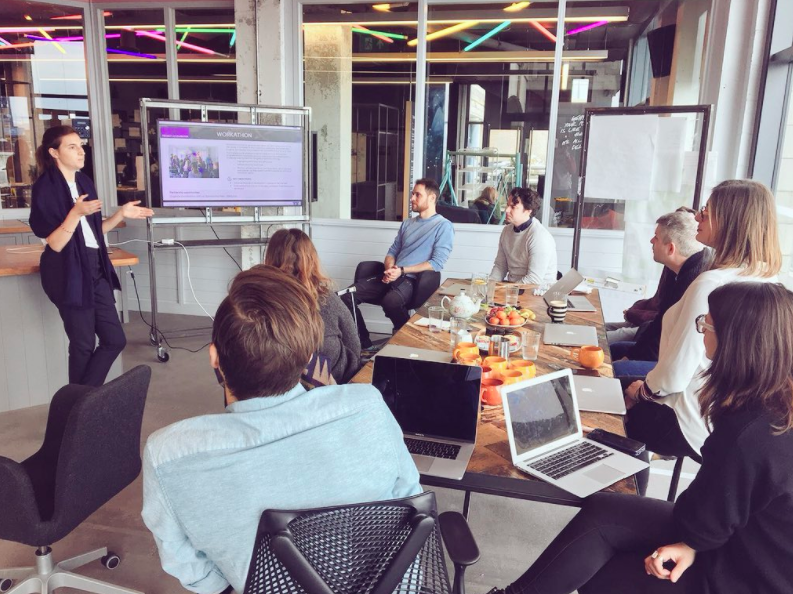 In fact, last February we were approached directly by the Lush Foundation to speak at their annual summit and collaborate on the development and promotion of their own data ethics policy. That looks like it’s going to form a big chunk of our focus over the coming year. Finding ways to educate the tech community and protect the most vulnerable in our society is relevant to everyone, and a challenge we relish. Looking ahead, I can’t wait to see how people translate the messages of this year’s festival into positive action. It’s easy to trash Facebook for letting standards slip, but some of those now throwing Zuckerberg under the bus were accepting funding from his organization two years ago and participating in the digging of data. Whether these platforms are good or bad comes down to how we use them. The reality is, we can’t just #DeleteFacebook until there’s something better out there. So, let’s engage, let’s organise, and let’s legislate for ethics in design and data to create bold new platforms that benefit us all.